It’s hard to pick a favorite with so many holiday options available in the Cincinnati theatre scene but you’d be hard pressed to find one more cheerful than EVERY CHRISTMAS STORY EVER TOLD . . . (And Then Some!) at Cincinnati Shakespeare Company. This comedic retelling of some of the finest traditional Christmas stories like Frosty, The Grinch, Rudolph and more but with a twist that only a cast like this can give it. 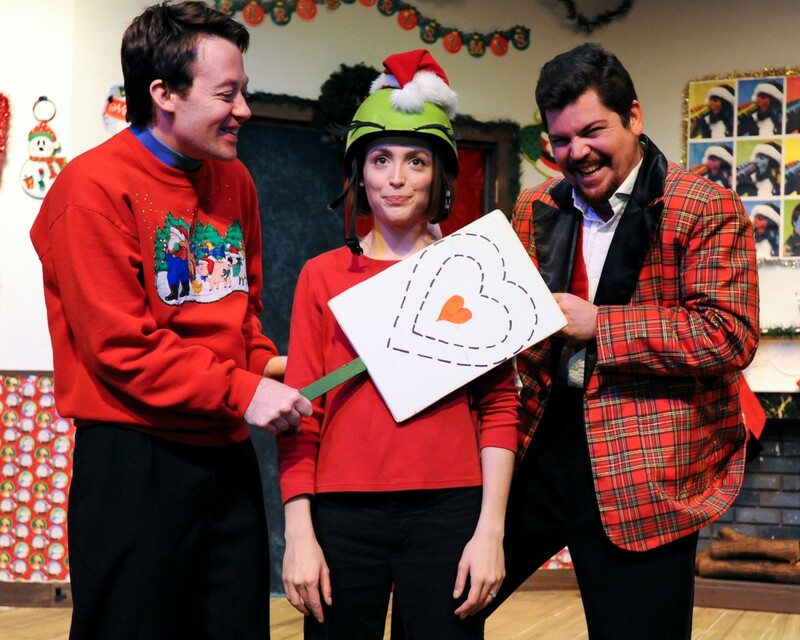 Directed by the hilarious-in-his-own-right, Jeremy Dubin, this all-star cast of Sara Clark, Justin McCombs, and Billy Chace (with a special appearance by Miranda McGee) shines with holiday hysterics. Clark just wants to perform A Christmas Carol; Chace and McCombs want to be more inclusive. That’s the premise and from the get-go, its off to the races with rapid fire pop-culture references, recurring gags, and slapstick humor. And a whole lot of it. McGee sets the tone for the show out of the chute and continues her streak as one of Cincinnati’s most charming comediennes. You can pretty much just wind up McCombs and let him go; his wide-eyed innocence is such a strength but he ultimately steals the show for me when he plays it straight in his reciting of the Gospel account of the birth of Christ. It’s a rare moment of reverence and a welcome one amidst the silliness on stage. Chance is at his best when he’s bombastic, but really gets my goat is when he cracks himself up or reacts to the crowd and then moves into ad lib territory. For someone so over the top, he’s quite honest. And Clark, who’s known for her serious acting and directing chops, is able to hold her own with these powerhouses of comedy by letting loose, being as physical as the boys, and maintaining that air of professionalism we always see. The costumes remain the same, and they work well. Hungerford’s set seems familiar, though I don’t remember if there were any changes since last year. It’s functional, festive, and does the job. The sound and lighting are minimal; there are some missed opportunities for sound effects. And my complaint every year is that the finale song is unnecessary and make the show about 3 minutes too long. But these are minor quibbles. One of the highlights for me as a repeat viewer is the “fruitcake” segment that is updated every year to reflect some culturally relevant material. I won’t spoil it, but this year’s surprise is fun in a much different way from last year’s also entertaining “Blurred Lines” parody. This show is a treat; ordinarily Cincy Shakes doesn’t provide many media passes to this one. They don’t need to as it sells out most performances of its limited run. But I am so grateful to Jeanna and the folks for allowing me to come celebrate one of my recent holiday traditions and take part in the rambunctious EVERY CHRISTMAS STORY EVER TOLD (and the opening night pizza from Mac’s Pub was incredible! I even spilled some on my shirt for later…) This is one of Cincinnati’s funniest holiday offerings and I highly recommend you find a ticket! EVERY CHRISTMAS STORY EVER TOLD . . . AND THEN SOME! runs through December 28th at Cincinnati Shakespeare Company in downtown Cincinnati on Race Street. For tickets and more information, click here. The show is appropriate for older teenagers and adults due to some PG-13 content.